The local language of the Kalinga people, Kinalinga, was recognized with the marker called “Bantayog-Wika,” mounted at Kalinga State University. Bantayog-Wika is a project of the Komisyon ng Wikang Filipino, headed by National Artist for Literature Virgilio Almario, who is also NCCA chair. The project aims to build markers for every Philippine language all around the country. Some 131 markers are set to be built and Kinalinga was only the fourth to be given a marker. Almario explained that Bantayog-Wika would focus on endangered or dying languages, as younger generations from various ethno-linguistic groups are talking in English or Filipino more and discarding their own linguistic heritage for economic advancement. “This marker will be a cornerstone and a reminder of how important native languages are and will keep young people in touch with their culture,” said Almario in Filipino. Language expert Mary Kayaman demonstrated the richness of the language by rendering various chants in Kinalinga. She chanted an “Uwawi,” the local lullaby to put infants to sleep, and the courting chants, “Kugnitan” for boys and “Chuchukan” for girls. She also demonstrated chants on rice planting, harvesting and grinding. She said the chants must be conserved and passed on to the next Kalinga generations. Also awarded by the NCCA was Kalinga master tattoo artist Maria “Apo Whang-od” Oggay. Conferred on her was the Dangal ng Haraya Award for Intangible Cultural Heritage at the Kalinga Capitol Plaza, Tabuk, Kalinga. It was the first time that the award was given to a traditional or folk artist. Past recipients have been the late Sen. Edgardo Angara, architect Augusto Villalon and journalist Susan Calo Medina, anthropologist and former National Museum director Jesus Peralta and Sen. Loren Legarda. In a special resolution on May 2, the NCCA board headed by Almario recognized Whang-od as one of the oldest living traditional whatok (tattoo) practitioners of the Kalinga community. Eva Oggay, the honoree’s grand-niece, told the Inquirer that Whang-od had turned 102 years old last February. Apo Whang-od received the award with a big smile and rendered a chant in Kinalinga. Kalinga Mayor Sacrament Gumilab said Apo Whang-od had given Kalinga a positive image. He explained Tinglayan, Buscalan was known only for two things, both negative: marijuana and headhunting. 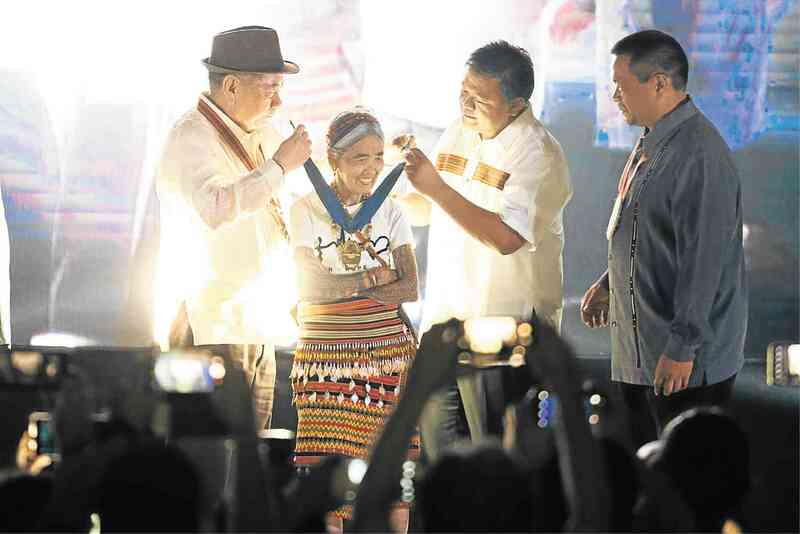 “But now, Apo Whang-od has given the province a new light and now Kalinga shines in the world map because of her and the intangible heritage and art of the manwhatok,” Gumilab said. Apo Whang-od’s designs are based on nature and the cycles of life. Here she tattoos a crab motif. Sugguiyao explained that in ancient times, tattoos were earned by warriors when winning battles and by headhunters. She said it was a status symbol, so it was costly. One would need to give the manwhatok artist one pig or a big bundle of grains just to get one, she added.